At Northside Dental Surgery our aim is to provide dental treatment of the highest quality while making your treatment experience as pleasant and pain free as possible. Our overridding ethos is prevention and early intervention. We adopt a minimally invasive approach while maximising results. Through continuing education, Andrew ensures he is at the fore front of dental innovation and procedures. Last year he completed a residency in Los Angeles in Bioblock Therapy (this is an orthopedic appliance that facilitates correction of facial growth which results in better smiles and better health!). 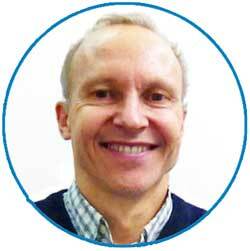 Andrew has a particular interest in Orthopedic Orthodontics which takes a holistic appraoch. You can view some of Andrew's cases by clicking here. At Northside Dental Surgery, we offer a comprehensive range of dental treatment for all age groups. This includes, cosmetic dentistry, implants, restorative treatment, endodontic (root canal treatment), pedodntics (all aspects of children's dentistry), prosthodontics (crowns and bridges,dentures) etc If you think we can be of help to you - we would love to hear from you! Northside Dental Surgery is coveniently located upstairs in Northside Shopping Centre and there is always plenty of free parking! Temporomandibular joint disorders are problems affecting the jaw joint - usually pain or reduced movement of the joint. There are various causes but mostly it is not a serious condition, and often improves with simple treatments. Dental implants are the best long-term solution for missing teeth. An artificial replacement tooth is attached to the implant.